Breakfast may be the most important meal of the day, but when a school lunch is packed with love, care, and plenty of style, it can become the most important moment of the day. We have three fun Disney-inspired ideas for what to pack for a midday boost that your little Disney fan will gobble up! Check out the awesome lunch totes from Disney store, tote-ally delicious snacks, and a printable message for the sweetest surprise of all! 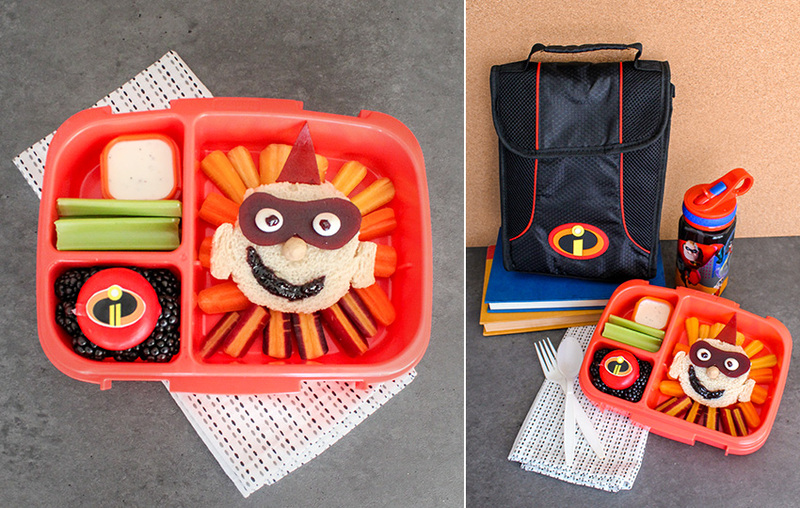 They’re suited up and ready to learn; now equip your half-pint hero with a nutritious yet action-packed lunch—in this sleek Incredibles 2 lunch tote—that’ll give them all the energy they need to be SUPER! Cut Jack-Jack’s face out of two pieces of whole wheat bread, cutting out a piece for his mouth. Then, make a peanut butter and blackberry jam sandwich, placing the jam on top so it shows through to create his mouth. Complete the face with fruit leather mask and hair, yogurt-covered raisin and jam eyes, and a bread-ball nose. Rest him on a bed of “explosive” carrots. Print the provided Incredibles logo and press it onto a mini cheese wheel. Rest the cheese on fresh blackberries. Complete the meal with cut “laser” celery with a small container of ranch dip. 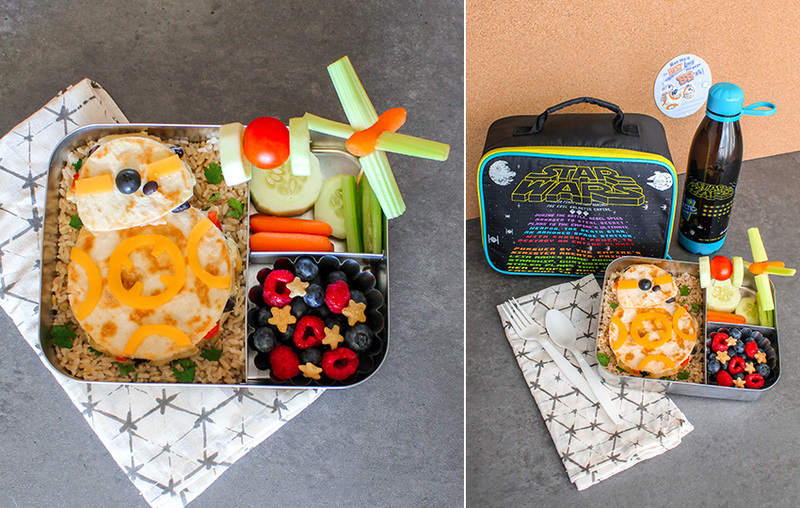 You don’t have to pack for a galaxy far, far away to make your student’s midday meal a galactic voyage! Just send them off with this Star Wars tote and an out-of-this world treat. Create a BB-8 quesadilla using a thin layer of reduced-fat cheese, black beans and peppers sandwiched between two tortillas (whole wheat for a healthier choice), toasted lightly on both sides. Decorate with a black olive and reduced-fat cheddar cheese cut-outs for accents and place on top of a bed of “Jakku Desert” brown rice and cilantro. Add mixed berries and a few cereal stars to create a galaxy. Cucumbers and a cherry tomato held together with toothpicks make excellent TIE fighters. Carrots and celery will create a great X-wing. Be sure to remove the toothpicks before chomping away! 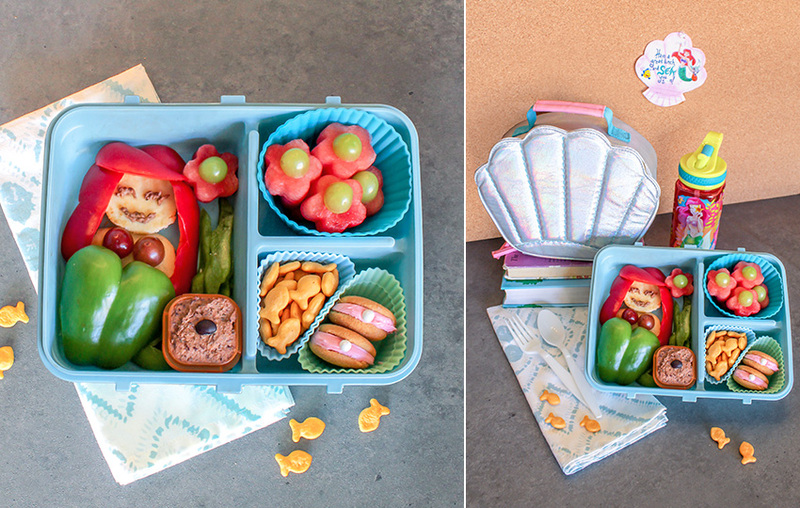 Dive into a delicious and healthy lunch with Ariel and this fun Little Mermaid tote! Create Ariel using pita bread (whole wheat pita for a healthier option) for her face and body, red bell peppers for her hair and green bell peppers for her fin. Use grapes for her signature seashells and black bean dip to outline her eyes and smile. Fill in the surrounding sea with a scoop of goldfish crackers. Sea flowers made from grapes and watermelon and two small clam cookies made from a bit of frosting and candy round out the meal! Include A Personalized Disney Note! Want to make your little Disney fan feel extra special? Click on the image below and download these fun printable messages to pair with their delicious lunch.